Matt Thomas received his Master of Library and Information Science from University of Western Ontario (London, ON) in 2000. Before coming to Laurier in 2011, he worked as a professional librarian at the Northern Ontario School of Medicine (Thunder Bay, ON), Queen's University (Kingston, ON), and Queensborough Public Library (Jamaica, NY). 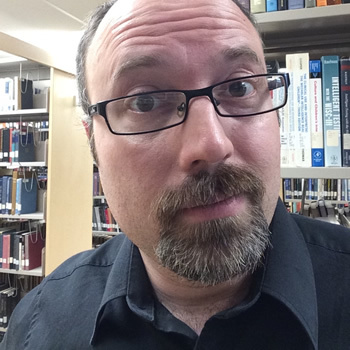 Although he has a range of experience in librarianship, his professional and academic focus is on access to resources, technological or otherwise. For my complete list of publications see my Google Scholar profile and my Academia.edu profile. Office hours: Please contact him to make an appointment.